"Hello, big town. Are you ready?" Unless you're eligible for Social Security, or are seriously into the big band sound, there's a strong chance that you know little or nothing about Gene Krupa, and the prospect of watching the Hollywood version of his life story may not be the most inviting one. Krupa was one of the great drummers of his time, and he's given the studio treatment here; it's far from being a great movie, that's for certain, but it's a competently told story, at least, with some swinging music, for its time. 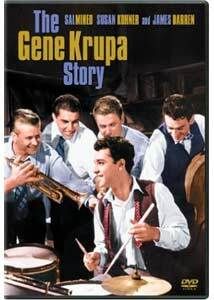 This is very standard Hollywood biopic stuff, following the template of movies like Pride of the Yankees or even The Jazz Singer: Gene Krupa is a Chicago lad, son of immigrants, with a dream. His father wants him to be a priest, but Eugene gives over to devil music�he wants to play those drums. Early on, the big lure, of course, is that chicks dig drummers�you know what kind of movie you're in pretty quickly, when one fetching young thing demands that Krupa be her date at "a weenie roast and swim party at my house next Saturday." Gene even dons the seminarian's robes, briefly, but ditches them after his father dies; the speakeasy is a more powerful lure than the priesthood. Gene, his best buddy Eddie, and Eddie's girl, Ethel, light out for New York, certain that they'll find greatness there; after a reel or two of struggle, of course Gene does. Soon he's playing with the brightest lights of the big band era�Tommy and Jimmy Dorsey, Jack Teagarden, Red Nichols�and living the high life. It's clear that Ethel wants to be with Gene, and not with Eddie: will Gene take his best friend's girl? Or will he continue living the high life, and all the many perks that come with? Sal Mineo as Krupa seems almost simian when he's hacking at the drums; he was only 20 when the film was made, and it shows, as he's much better early on during Krupa's times of struggle than he is with the perils of success. So if the story is forgettable, the best part of the movie is certainly the music. It's almost quaint to watch a film in which the racy number is a jazzy Back Home in Indiana, but it swings, as does On the Sunny Side of the Street, and an Anita O'Day version of Memories of You. Some of the biggest names in jazz play themselves�Nichols, O'Day�and others are played by worthy successors (e.g., Bobby Troup as Tommy Dorsey). This is fairly forgettable, ordinary fare, but it does have its foot-tapping moments. Image Transfer Review: There are many flecks, scratches, and imperfections in the print, and the transfer to DVD seems to have been done without much care. Some of the original black-and-white photography still looks sharp, but that's in spite of the transfer, not because of it. Audio Transfer Review: The soundtrack is pretty clean, but there are some pretty severe balance problems. Basically, if you're listening to the dialogue at a reasonable level of volume, a musical number will creep up on you and send you scattering for the remote; the music is just impossibly and unreasonably loud. You'll want to watch this movie with one hand on the volume button. Extras Review: Just a trio of other Columbia trailers. A run-of-the-mill Hollywood biopic, highlighted by some of the best music from the period of Krupa and his time.